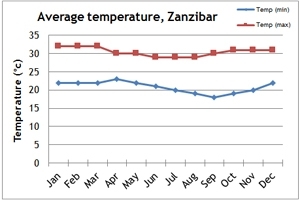 Our climate charts will give you an idea of the weather conditions in Tanzania. 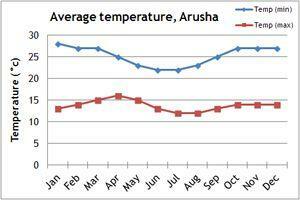 Located near to the equator, the temperatures are fairly stable all year around. Of course the temperature will drop the higher you climb, with temperatures below freezing at the summit of Kilimanjaro. January to March and June to September are the driest months to visit Tanzania. This is the best time to go on a wildlife safari as the animals will be concentrated around the remaining rivers and waterholes. Drier weather also means fewer mosquitoes. 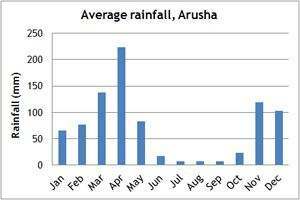 April and May are the wettest months and are considered to be the quiet season. October and November are also wet. We have chosen not to organise group departures during these months, as travel arrangements can be affected by the rain. 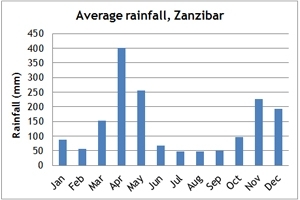 The weather in Zanzibar closely follows that of mainland Tanzania although tends to feel a touch more humid and can occasionally experience rain even in the dry season. If you can't make the dates of our group departures, then take a private departure on dates to suit you, or we can create a Tailor Made holiday to Tanzania, especially for you and your family or friends.